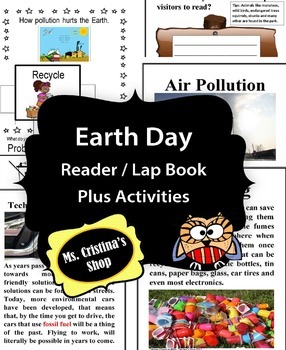 Teach about Earth Day to your class with this unique reader and activity pack. You will finish your class putting together a lap book. Reader has bold and bright pictures with big print so your kids can read and highlight as they wish. Reader also comes with activities your class will answer as reading comprehension. The Circle of Life: Put together the how things relate to each other. This is done to help the kids understand that by damaging one another also gets damaged. How can I help keep a cleaner earth? Two pictures to put together that would help your kids understand how pollution destroys the earth. Please visit my blog before you purchase this unit so you can view the activity up close. I have included detailed instructions and pictures on how to put the lap book together.